When explaining Yoneda I find it useful to do the pre-order case first. It states that in any pre-order, x<=y iff for all z, z<=x implies z<=y. The proof is trivial, but the utility of this little lemma is amazing. One example is in the proof that every Heyting algebra (exponentiated lattice) is distributive. It is a dawdle using Yoneda; I don’t know how to do it without it. I was thinking of including the pre-order example, which I saw mentioned in your Oregon lectures (which I keep re-watching, every time understanding a little more). I wasn’t sure how to explain the “implies” part though. But you’re right, it is trivial. The sets in question can only be a singleton and an empty set. There can be no function from singleton (corresponding to z<=x being true) to an empty set (corresponding to z<=y being false), so the existence of a natural transformation is equivalent to the implication z<=x => z<=y. The cool thing about blogging is that I can modify a post in response to suggestions. So I will revise this post to include this example. And I’ll include a poset example in my next post on Yoneda embedding. 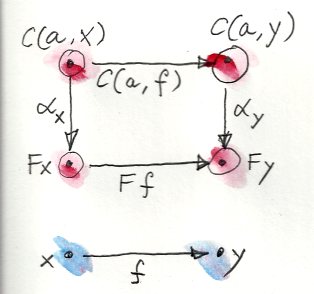 As for Heyting algebras, that would require a blog post or two just to introduce the concept. I don’t assume any particular math knowledge beyond high school from my readers, so I avoid examples that involve formal logic, topological spaces, etc. Yes, I had thought of remarking about the “implies” as a degenerate natural transformation between hom sets, but decided to be brief. Since it looks like the introduction to Monads is coming closer: I know too little about all this but there is a recent paper here: http://okmij.org/ftp/Haskell/extensible/ describing computationally efficient, composable methods to handle side-effects. Maybe some of it would be valuable for Monads? Or maybe for later topics. @benmoussa: Good catch! I didn’t like the colors in this diagram anyway, so I’m going to redo it. Does this mean type system is boolean? I.e. double negation (A->|)->| can produce A for all A. Is it okay that a theorem proven in Sets is applied to Hask? @vpatryshev: I decided from the very beginning to ignore the Hask vs Set distinction, unless otherwise noted. There are some good reasons for using Set arguments in Hask, although one should always be careful. See for instance Fast and Loose Reasoning is Morally Correct. As a quick side-note, I’d go further than saying Cayley’s theorem is the closest analogue to Yoneda. I’d say that it is Yoneda, in the special case of a category with one object and all isomorphisms. 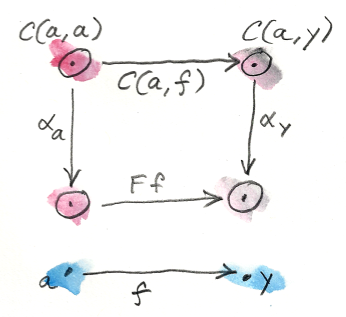 Representable functors in that case are nothing but G-torsors! Is it precomposition or postcomposition? If we do f . h, which is f after h, shouldn’t we say that we post-compose with f (or we pre-compose with h)? Yes, pre and post are very ambiguous in this context. Normally we consider putting something on the left as “pre”, but the left function is executed “after” the right function so, in this sense, it’s “post”. There doesn’t seem to be a consensus, as seen in this discussion. 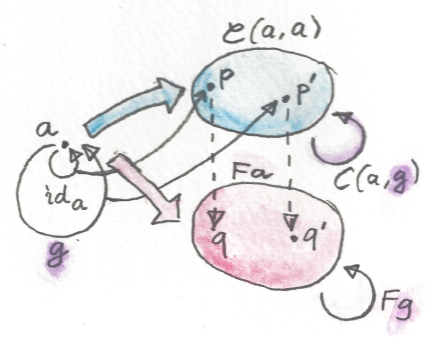 I’ve heard that Coyoneda is just the Free Functor. How can I understand it? And they call covariant version Co-Yoneda? 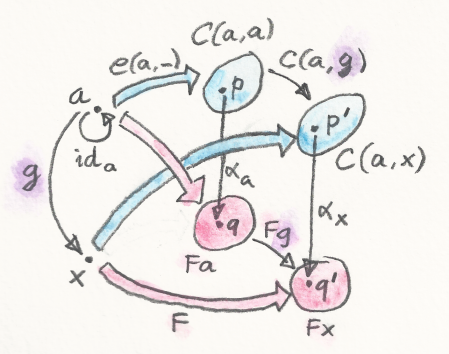 I discuss the free functor in the post on Kan extensions. It is indeed identical to co-Yoneda. 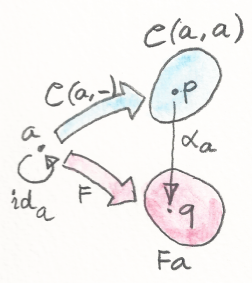 See also Haskell library Data.Functor.Coyoneda. Isn’t it every group is isomorphic to a subgroup of the permutation group of some set (or in particular the permutation group of its underlying set)?